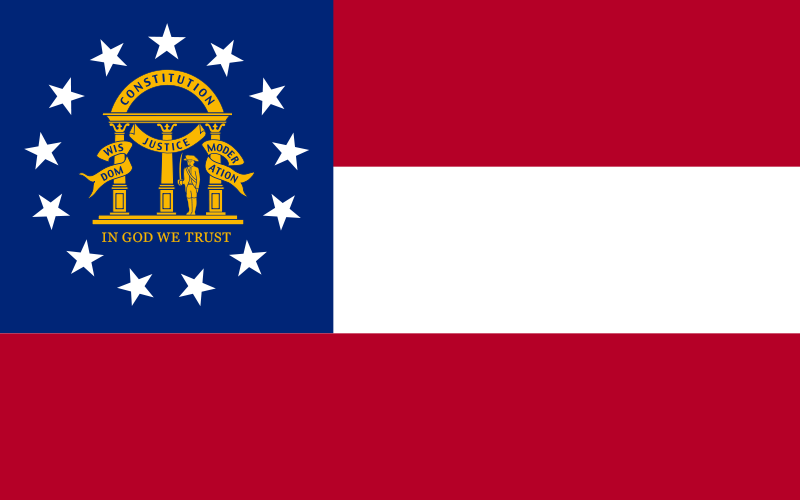 Georgia was the final of the 13 original states to be formed. The lands in the current state of Georgia saw its first European settlers coming from Spain in 1526, and over the following decades, saw more and more Spanish move north from Florida. However, they soon came into conflict with the English who moved south from their Carolina colonies. Conflict broke out properly between Britain and Spain by 1670, and saw the Spanish effectively forced out by 1704. The area was formally settled by the Yamasee Indians who where allied to the British. However, following the Yamasee war of 1715-1717 saw the Yamasee Indians devastated, and fleeing south. This left the area of Georgia effectively depopulated, and ripe for a new British colony. Aggressive settlement began from England by the 1730's, with the establishment of colonies made up with people moving from England to escape debtors prisons, looking for a new life. Georgia was formed in honour of King George, and was established in 1732 with the granting of a Royal charter. Spain looked to regain control in the 1740's, only to be defeated by local militias. This left it in no doubt that England held sway in the region. From 1735 to 1750, the colony formally banned slavery as a matter of policy. 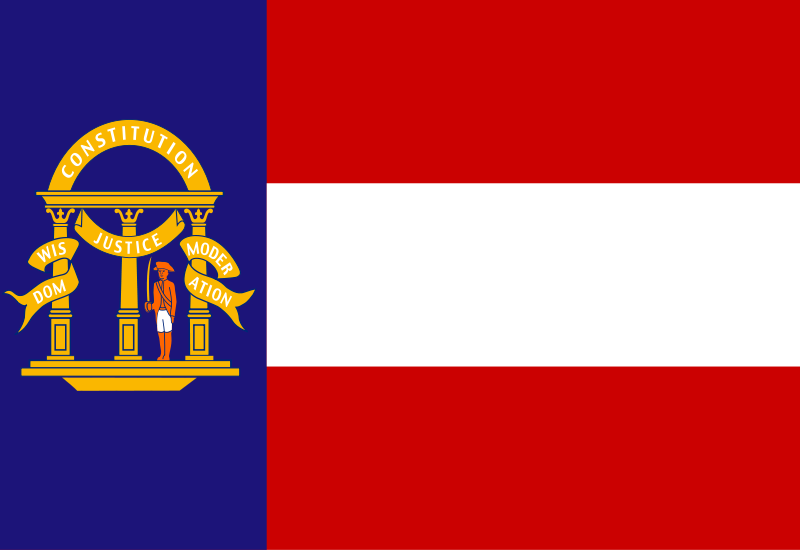 However, with the improving economics in Europe slowing immigration, and the success in the Carolina's which did allow slavery, Georgia took the decision to drop its ban. Following the ban, from 1750, to 1775, slavery grew at such a rate, it went from around 500 to 18,000 slaves. During the Seven Years War, which Britain fought with France, Georgia was sufficiently far from the battlegrounds that there was no direct threat. However, forces where built up because of a fear that Spain would look to take advantage, and expand Spanish control in the southern America's by pushing north from Florida. 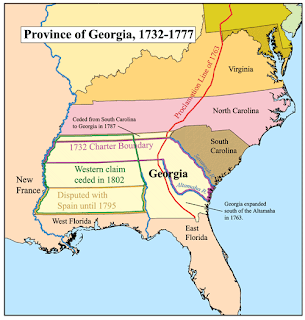 By the time of the Revolutionary War, Georgia did not have any real gripe with Britain in itself, but sided with its colonial brothers and rose up in solidarity. Georgia effectively kicked out the British, and became a self-governing state. However, given Georgia's position with its coast and ports, the British came back, and almost pushed the Revolutionaries out. 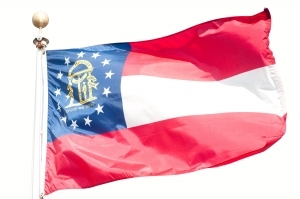 Georgia was one of the last bastions of Loyalist control at the end of the Revolutionary War. The initial borders of Georgia lay within the Altamaha and Savannah rivers, following between them all the way up to their ends, where the territory essentially carried in a straight line due west to the Mississippi. Its territory expanded south in 1762, forming the boundary between Florida and Georgia we see today. It ceded lands back to South Florida in 1795, and ceded its Western claim in 1802. But it did extend its territory north with territories ceded to it from South Carolina in 1787. 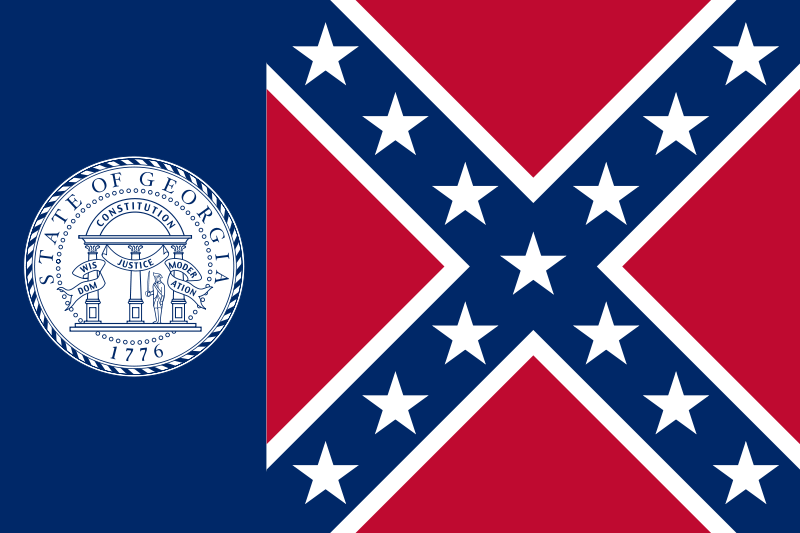 Georgia was one of the first states to cede from the Union, and join the new Confederacy. Though they did keep the name "State of Georgia." During the War, it was felt that Georgia was relatively safe from the ravages for war. This, however, was not to be. Georgia was ravaged by war, leading to massive food shortages. 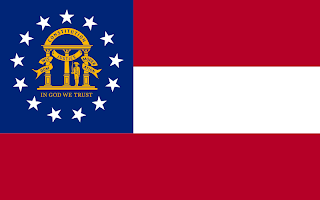 In the post war period, as Georgia was undergoing post-war reconstruction, it took Georgia until 1870 to be re-admitted to the Union. And during the period, Georgia was home to some of the worst excesses during the military occupation. In one incidence, companies could lease prisoners to help Georgia rebuild and industrialize. This led to reports of brutality being totally ignored. In 1885, Georgia saw the birth of one of the worlds most famous brands. Atlanta and Fulton county decided to act to curb one of the "great excesses." Alcohol was banned. 2 years later, a chemist came up with a new sweet drink which he sold off. That sweet drink became known as Coca Cola. 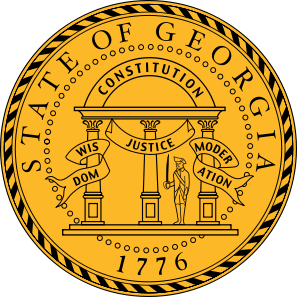 The Great Seal of Georgia was formally adopted in 1776, with the adoption of the Constitution. It has remained largely unchanged since, with minor alterations. 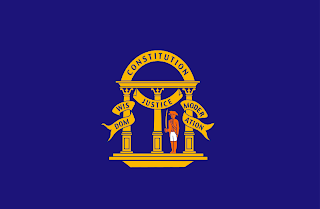 The seal in the centre features a central arch, representing the state constitution, and three pillars which represent the three branches of government. Legislative, executive, and legal. Wrapped round the pillars is a ribbon bearing the state motto, "Wisdom, justice, moderation." Beneath the arch is a soldier with a drawn sword. Possibly from the American Revolution. This also serves as the states coat of arms. 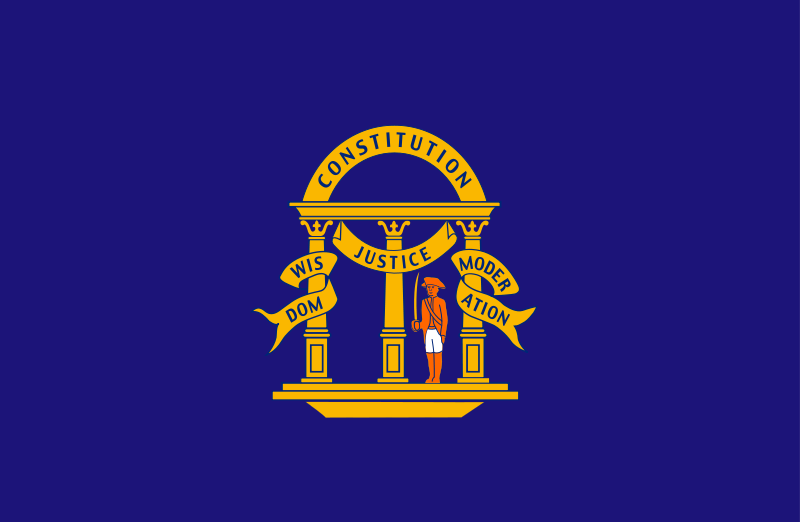 Surrounding the coat is a ring, within which features the text "The State of Georgia" and the number "1776." The number was originally 1799m which was the date of the formal adoption of the seal, but was changed in 1814. On the reverse, a ship is moored along Georgia's coast, bearing an American flag. This ship has arrived to take on a cargo of tobacco and cotton, representing Georgia's export trade. A second ship is bringing crops from the inland regions, representing internal traffic. In the background, is a man plowing, and a flock of sheep. 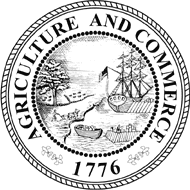 Surrounding all this is a secondary motto, "Agriculture and commerce." In terms of state flag, there are no strong records detailing anything before 1879. However, it is likely that a simple banner was flown, as all regiments during the Civil War had some kind of banner identifying where they came from . 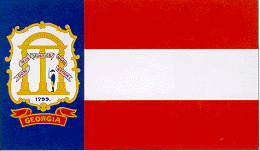 At the time, many used a simple blue banner, with the states coat of arms on them. Though there where no rules on size, or colour of the coat of arms. 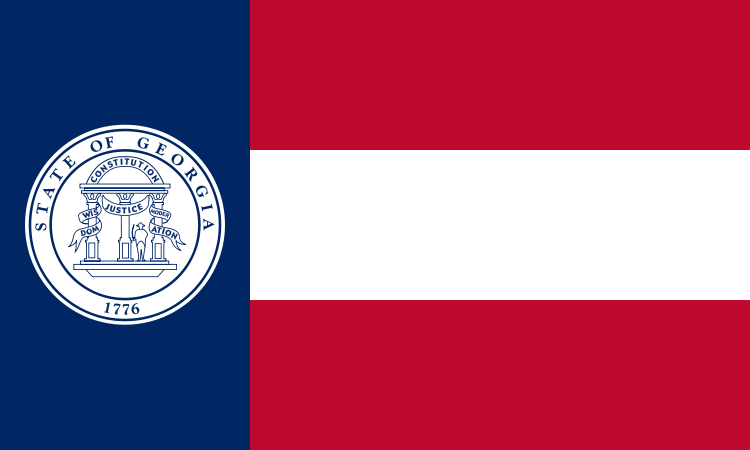 In 1879, Georgia introduced a new state flag. 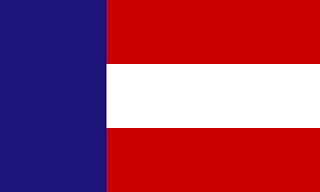 It bore a strong resemblance to the original "Stars and Bars." The first Confederate flag. 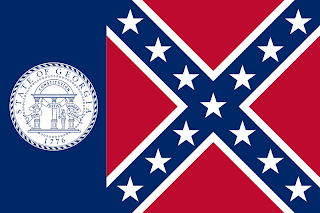 But the Georgia flag took the blue square in the upper canton, and stretched it to the the full length of the hoist. In 1902, Georgia added the coat of arms in the centre of the blue. 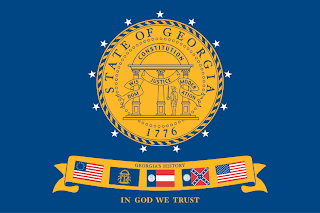 And then, in 1906, the Georgia placed the coat of arms within its own shield, and added a ribbon beneath bearing "Georgia." Then, in 1920, a further chance saw the coat of arms replaced with a blue on white depiction of the Great Seal. 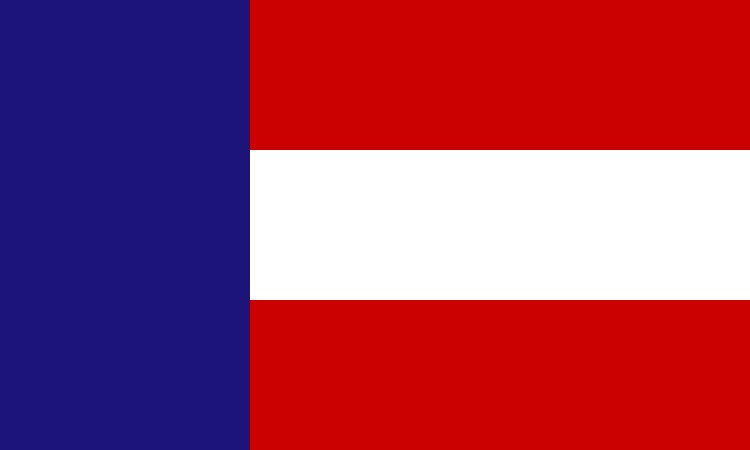 One major adaption was in 1956, when the original 3 red and white stripes where replaced with the old Confederate battle flag, of a blue saltire on red, bordered in white, and featuring white stars. This was hugely controversial with many protesting that the change came about to celebrate an upcoming anniversary of the Civil War, with others protesting just as vehemently that the flag was simply a racist protest, during a time of great civil unrest in the US. The controversy rumbled on for nearly 50 years, with several attempts to modify it blocked. However, the flag was finally altered when, after huge public outcries, a new flag was introduced. This time, going back to a plain blue flag with the Great Seal placed in the centre. Surrounding the seal where 13 white stars, representing the 13 original colonies. Under the Seal, a ribbon bearing some of the flags that had flown over Georgia, including the Bettsy Ross flag, the Blue coat of arms flag, the 1920's flag, the 1956 flag, and the current US flag. This flag lasted about a year, when following another public campaign, a new flag was introduced. This time, taking the first Confederate flag, the "Stars and Bars" and placing in the upper hoist (blue) canton, the states coat of arms, surrounded by 13 white stars.